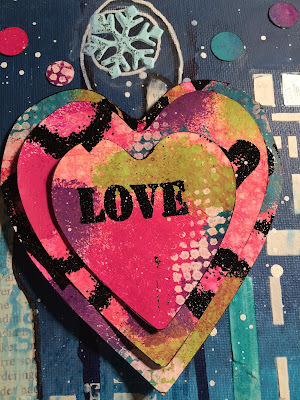 The hugely creative Anita has a blog called Niti's Art from Heart and I would urge you to pay her a visit and soak up the inspiration by clicking on the link. I am so excited to be the Top Talent and have the opportunity to be guest designer at Our Creative Corner. I chose to make a canvas art based in the Nordic / Scandinavian light. Particularly light in winter. As you all now it is very cold in Norway, special in wintertime. Those little men and that little boat you can see in the light areas is rubberstamp made out of drawings of original rock carvings in Scandinavia that dates some 3000 years back. Isn’t that cool? 2. Do you live by any motto or philosophy? I do have a motto, and that is: Remember yesterday, think of tomorrow, but live today. 3. What other hobbies/talents do you have that you may like to share with us? Oh, I do a lot of things. I love crafting, so I’m doing a bit of knitting, crocheting, and renovation / painting of small Furniture. But most of the time I am Art Journaling. It became a near friend of mine and I have my Art Journal With me all the time. When I am traveling I bring my Art Journal and pens, scissors, glue and a ruler (Dylusions Journal Block) with me. 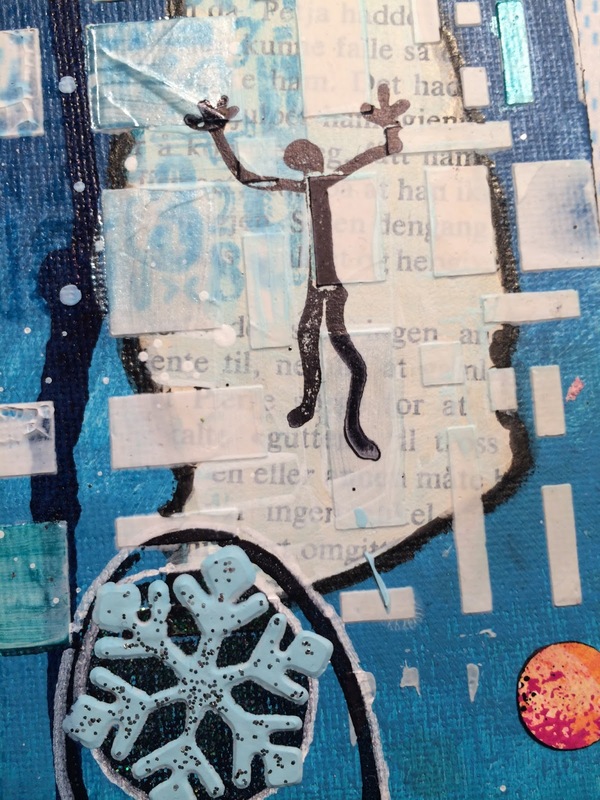 And I also love Mixed Media Art on canvas. I do a lot of canvas as well in all sorts of shapes and designs, but I'm a close friend with strong colors so I make mostly art with bright and happy colors. 4. How long have you been crafting and what made you start? I think I've been crafting all my life, since I was a little girl I’ve always painting and drawing. I do not know how it is in your country, but at the Norwegian primary School there is a study called electives where I chose rosepainting. I think that's how it starts. I did like rosepainting and I got a lot of positive feedback from teachers and classmates. Rosepainting is a classic old Norwegian way to paint roses and leaves in the primary colors of red, blue green and yellow. I am not so very fond of this technique now ;-) Art journaling, I started actually with having been on sick leave for a while and sat and surfed the internet and YouTube and discovered Dyan Reaveley. Now I have seen all her videos several times and she is absolutely amazing. She gave me the kick start. 5. Name three of your favourite crafting techniques and why you like them so much. My three favourite crafting techniques is number one: inking. Just sit down take my Dylusions ink spray and just spray. I like the inks because they provide so strong colors and they have a little life of their own. One is never quite sure of the result. It gives me a bit of unpredictability. And stamping of course. I love stamping. When I first get started, I cannot stop. I use a lot of stamps. Both background and for image. 6. If you lose your 'mojo', how do you go about getting it back? When I lose my mojo I see a video or two on YouTube of my absolute favorite artists: Dyan Reaveley, Nika in Wonderland, Mimibondi and Dina Wakley. Then I just go step by step of one of their tutorials and I'm all in again with tons of inspiration and creativity. Thank you for taking the time to read this. I wish you all a pleasant and creative autumn. Thank you Anita for your wonderfully detailed answers. It's like sitting down and having a wonderful chat with Anita isn't it? Anita, your canvas is full of colour and love! 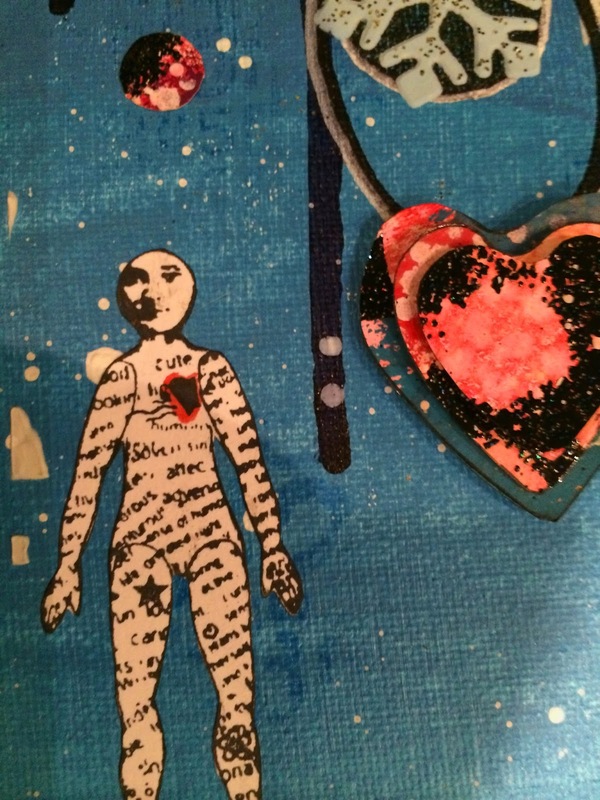 The details are wonderfully put together and it's obvious that you have poured love into this canvas. That heart is stunning! Please remember to pop over to Niti's Art from Heart and leave Anita some love - she deserves some back in return! Anita will now join our Top Talent hall of fame and I do hope she comes back to play with us again. Will you be our next Top Talent? To be in with a chance you need to join in our latest challenge 'Halloween Horror' which runs until October 28th so you have plenty of time and we'd love to see you there. Thank you so much for joining us today and reading all about our latest Top Talent. Great canvas with contrasting colours! Thanks Anita! Let's go Trick and Treating!